We’ve kicked off 2017 with some exciting news here at Adore Cosmetics headquarters, with celebrities loving our masks and a sponsorship opportunity in Dubai. Read on for the details on Adore’s January 2017 news! The infamous Jeffree Star of Jeffree Star Cosmetics together with Manny Mua a.k.a. Manny Gutierrez reviewed the Adore Cosmetics Golden Touch Magnetic Mask on YouTube this month, raving about the glow it left on their skin. They also posted about it on social media (see the Instagram post here). Manny Mua is a self-proclaimed “BOY BEAUTY VLOGGER.” He makes video reviews and tutorials on cosmetics and beauty trends and is Maybelline’s first male beauty model. Jeffree Star is a singer-songwriter, make-up artist, fashion designer, and model. They make hilarious videos together! As reported in TMZ, Adore Cosmetics was one of the sponsors of Mario Dedivanovic’s Master Class tutorial featuring Kim Kardashian in Dubai earlier this month. Kardashian went on stage in front of a thrilled audience, as her favorite makeup artist and friend Mario Dedivanovic did demonstrations on her as part of his class. Attendees were gifted thousands of dollars’ worth of Adore Cosmetics swag. It was a big deal and we were proud to be a part of it! Heidi from the beauty and lifestyle blog The InsideOutBeauty did a thorough video review of the Golden Touch 24k Techno-dermis Facial Mask from Adore Cosmetics, already reviewed and featured by publications across the interwebz (it’s a big favorite!). She examines everything about the mask, from packaging to the experience to the after-effects to answer the big question you may be wondering about: is the Golden Touch 24k Techno-dermis Facial Mask worth the decadent $3,300 price tag? Olivia Culpo — American actress, model, television presenter, cellist, and beauty queen from Rhode Island who won the Miss USA pageant in 2012 — posted on her Instagram Stories & Snapchat about Adore’s masks and how excited she is to try them. A veritable beauty addict, Olivia Culpo has talked to exciting publications including Byrdie, Marie Claire, Allure, People, Pop Sugar, and more about her skincare routine and what works for her to keep her skin looking healthy and vibrant, highlighting the importance and powers of a holistic skincare approach. Her secrets include incorporating more greens and cutting out dairy, getting more sleep, and managing stress levels through meditation and yoga, as she wrote in Byrdie. 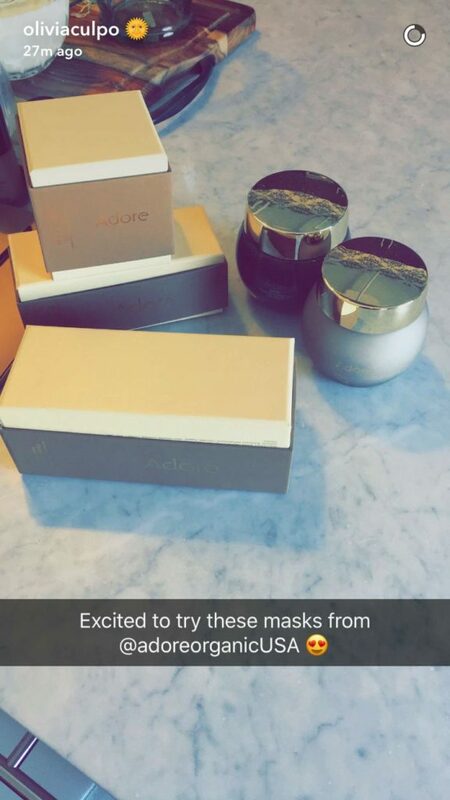 Now, she’s adding masks from Adore Cosmetics to the mix! Go here to find your own favorite mask from Adore Cosmetics. Another mention of our famous Golden Touch 24k Techno-Dermis Facial Mask from Adore Cosmetics! This time it was featured in Luxury Listings NYC in their Luxe Life section. “For your New Year’s resolution to… Look younger naturally: The Golden Touch 24k Techno-Dermis Facial Mask from Adore Cosmetics renews your skin with pure gold and age-defying plant stem cells,” Luxury Listings NYC wrote. Want to look like a million bucks… for free? 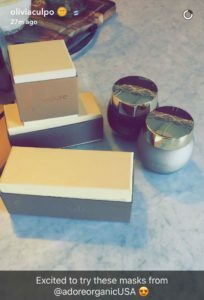 Melany from Melany’s Guydlines is giving away our Adore Cosmetics Golden Touch Magnetic Mask Giveaway (retail value $995) to one lucky winner. Click here to sign up to win. This mask has real gold powder mixed with antioxidants and other superpower beauty agents and is loved by celebrities from Jeffree Star (see above) to Erin Heatherton and Mario Dedivanovic!